As the Canadian Wood recycling industry expands, CWWR (Canadian Wood Waste Recycling Business Group) members are providing closed-loop diversionary wood, solid waste and leachate material recycling services in the Canadian logging industry – in the log sort yard sector. The log sort yard has its origin in water sorting yards where logs were sorted onto rafts for shipment by water to the mill. 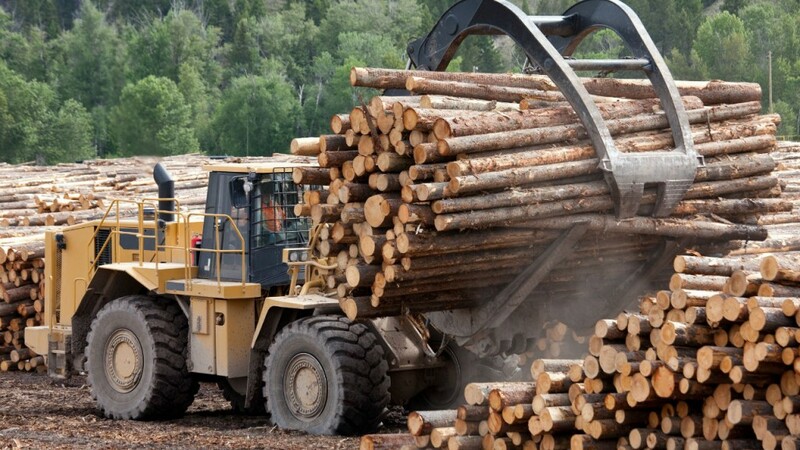 There are also several different types of land-based log yards serving a range of purposes. The traditional mill/log sort yard provides receiving and log storage for feeding the mill. Concentration log yards provide a central point for accumulating logs for long-distance shipment to mill yards. Log reload yards provide transfer points between truck, rail and barge transportation. A log sort yard takes advantage of an integrated log market and serves several objectives by sorting logs for the best available market. • Boulders (reusable => large boulders). Today successful closed-loop log sort yard recycling facilities are self-sufficient and have well-established markets, as well as a steady supply of wood and recycled, reusable log yard sorted multi-materials. Log sort yard concepts and new material recycling practices opportunities are open for new diversionary economic and environmental beneficial outcomes. It should be noted, however, that there are very few log sort yards currently that actually recover and sort their reusable or buried solid waste materials. A main challenge in the logging industry is to treat and remediate log sort yard waste water runoff (leachate). Twenty-four hours a day, 365 days a year, blackish water is running off old and newer log sort yards across Canada into local creeks and environmental water tables. This black water runoff is classified as a leachate, which comes from the wood waste, logs, bark, stick, clay, mud, dirt, rock and miscellaneous discarded mill and equipment waste being buried in log sort yards. Log sort yard waste water runoff, leachate, can be harmful to receiving watercourses, mainly because of the high concentration of organic substances and phosphorus that can cause eutrophication and oxygen depletion. Water leachate runoff from log sort yard wood and other solid waste material in the logging industry has been an ongoing issue for log sort yards owners. It has been found that different wood species yield different leachate compositions, with leachate from oak having the highest pollutants content, followed by leachate from pine, poplar, spruce, fir, cedar, maple and hemlock. Oak has the potential to leach about 10 times the amount of polyphenols compared with other investigated species (i.e., pine, beech and maple). Furthermore, oak leachates have the lowest ratio of biological oxygen demand (at seven days) which suggests a potential problem with the biological degradation of this leachate. It has also been shown that leachate from wood waste is potentially toxic to aquatic organisms. A positive log sort yard waste water runoff/leachate solution is to utilize optimum dilution ratio(s) and incorporate the use of environmentally sound scientific water treatment technology, such as Bioaugmentation, Microbe, Aeration, Granular activated carbon and Biochar treatment processes. All of these options can remediate waste water runoff/leachate. By using an optimum dilution ratio and microbes for various parameters to meet safe wastewater runoff, leachate discharge will vary from location to location. Each log sort yard is and will conduct the necessary governmental waste water runoff/leachate studies to determine the best practice in which to safely discharge the treated waste water runoff/leachate. The growth of recycling at both inland and waterway log sort yards for wood and solid waste material recycling is great news. More good news is that within the Canadian Wood Waste Recycling Business Group membership, there are many companies that have the industry-experienced people, mobile recycling equipment, scientific technologies and resources to provide the log sort yard wood, solid waste material and leachate recycling solutions this industry requires. Contact Jim Donaldson at the Canadian Wood Waste Recycling Business Group (CWWR) for more information on wood waste recycling business opportunities in Canada.